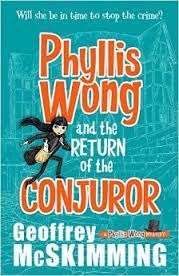 Phyllis Wong and the Return of the Conjuror, by Geoffrey McSkimming (middle grade, Allen & Unwin, May 2015), is this week's Timeslip Tuesday book, and after being somewhat spotty with having time travel books ready for Tuesdays, I'm happy to have gotten this one read and written about! Phyllis Wong takes conjuring very seriously; she is the great granddaughter of a famous magician, who vanished mysteriously at the height of his fame, leaving her a legacy of magical accoutrements in the basement, and she has cultivated her own impressive talents assiduously. (Me--I like this about Phyllis very much; I am always happy to read about people practicing their crafts!) When her great grandfather unexpectedly returns, looking no older than the day he vanished, Phyllis learns there's real magic in the world--her great grandfather has found the secrets of time travel, and now teaches them to her. Their first trip to Egypt in 1927 is simply practice, but then Phyllis finds herself drawn into a mystery that will take her back to Shakespeare's London. Another time traveler plans to steal the original copy of Shakespeare's lost play, The History of Cardenio, and Phyllis is determined to prevent this. But can she convince the suspicious Bard of her own good intentions, and foil the plot? Once Phyllis starts travelling back to the 17th century, the book really gets going, and is a fine, fun excursion; it's a pleasure to meet Shakespeare and his players along with Phyllis, and the villain is satisfactorily villainous, and Phyllis, and her little dog, are satisfactorily plucky. And her stowaway friend Clement, with his twin interests of zombie games and over the top disguises, adds nice comic relief. However, thing take a while to really get going; the meeting of Phyllis and her great grandfather and his explanations of time travel are rather less engaging, and the trip to Egypt added little; some readers might not be hooked enough to keep on till the good part! (I myself was getting a little doubtful, and so was happy to be pleasantly surprised by how much I enjoyed the story once Phyllis sets out to London!). The set-up for the mystery, involving a suspicions flood of mint condition first folios of Shakespeare's plays coming on the market, worked for me, but again I'm not sure a young reader would find that particular scenario immediately gripping. This is the sequel to Phyllis Wong and the Forgotten Secrets of Mr Okyto, which I've not read, but which introduces Phyllis as she finds herself solving a series of baffling robberies. There's not that much detective work here, but it is solid time travel adventure! The way the time travel works makes consistent sense, and although the past is the backdrop for the adventure, rather than being itself the point, its described vividly enough to make it an important part of the story. The third book, Phyllis Wong and the Waking of the Wizard, just now out in Australia, continues the time travel fun, and I'm looking forward to it! And I'm happy to have another title for my list of time travel with diverse protagonists! This sounds really fun. I do like time-travel books and Shakespeare, so this sounds right up my alley. I will have to check it out. If you are looking for time travel books (I am a new reader here, so perhaps you've already read this one), one of my favorites is Saving Lucas Biggs. Thanks for the post. Thanks for stopping by, Rosi! I hope you enjoy Phyllis, and I agree that Lucas Biggs is a good one!